Sou | 5:17 PM Feel free to comment! The one thing you can say about those WUWT contributors is that they are prepared to make a prediction, even though their predictions are laughable. Most of the people at WUWT just scoff at science but aren't prepared to stick their neck out. I've yet to see Anthony Watts make any prediction. Wondering Willis once made a guess that the world is about to get cooler. Perennially Puzzled Bob Tisdale, when pinned down, doesn't want to make any predictions. He's too busy keeping track of bits of the ocean in the hope that some bits haven't warmed as much lately (so that he can put up a chart of a patch of sea and say that global warming isn't happening, or it's not happening in that bit of the globe). It was freezing cold in the USA this winter, but it's not unusual? and more in the same vein. Clearly, on a national basis, recent winters have not been unusually cold. In the last 10 years, only three winters have been colder than the 1901-2000 mean. Moreover, no winters in recent years have come anywhere near to being as cold as some of the winters in the 1970’s, for instance, or earlier. It is abundantly clear that much less of the country has been affected by extreme cold this winter, and indeed other recent ones, when compared with the 20thC. There is also no trend towards cold winters becoming more common. What is also interesting is that there does not seem to be much of a trend towards milder winters taking over. Only the winter of 2011/12 stands out in this respect, and there have been plenty of similar years previously. So is it warming, cooling or doing neither? Anthony's readers must sometimes be scratching their head wondering whether to believe what they read at WUWT or whether to believe what they read at WUWT. John Holdren's statement, which Paul Homewood was countering, was from a video in which he discusses the polar vortex. “A growing body of evidence suggests that the kind of extreme cold being experienced by much of the United States as we speak is a pattern that we can expect to see with increasing frequency as global warming continues…. If you've been hearing that extreme cold spells like the one that we're having in the United States now disprove global warming, don't believe it. The fact is that no single weather episode can either prove or disprove global climate change. Climate is the pattern of weather that we observe geographically and over the seasons, and it's described in terms of averages, variations, and probabilities. But a growing body of evidence suggests that the kind of extreme cold being experienced by much of the United States as we speak is a pattern that we can expect to see with increasing frequency as global warming continues. And the reason is this: in the warming world that we're experiencing, the far north, the Arctic, is warming roughly twice as rapidly as the mid-latitudes, such as the United States. That means that the temperature difference between the Arctic and the mid-latitudes is shrinking, and that temperature difference is what drives what is called the circumpolar vortex, which is the great counterclockwise-swirling mass of cold air that hovers over the Arctic. As the temperature difference between the Arctic and the mid-latitudes declines, the polar vortex weakens, and it becomes wavier. The waviness means that there can be increased, larger excursions of cold air southward -- that is, into the mid-latitudes -- and, in the other phase of the wave, increased excursions of relatively warmer mid-latitude air into the far north. Computer models tell us that there are many different factors influencing these patterns. And, as in all science, there will be continuing debate about exactly what is happening. But I believe the odds are that we can expect, as a result of global warming, to see more of this pattern of extreme cold in the mid-latitudes and some extreme warm in the far north. Essentially, what John Holdren is describing is the hypothesis put forward by Jennifer Francis and Stephen Vavrus in a paper in GRL in 2012. As John Holdren says, "there will be continuing debate about exactly what is happening". Indeed the Francis hypothesis is the subject of ongoing debate. Some scientists, such as Kevin Trenberth, disagree quite strongly. Others are more circumspect and are entertaining the idea that the hypothesis has merit. The most vociferous critiques, however, have come from researchers who study atmospheric dynamics, or the many mechanisms that jostle and shape air masses. Given the Arctic's relatively puny influence over the planet's atmospheric energy flows, the notion that it can alter the jet stream "is just plain wrong," says dynamicist Kevin Trenberth of the National Center for Atmospheric Research in Boulder. The more likely culprit, he says, is natural variability driven by the tropics, where Earth gets its largest input of solar energy. Such variability, Trenberth says, could explain the jet stream's giant curvy shape this past January, which brought record chill to the southeastern United States, warm temperatures to Alaska, and made "polar vortex" a household term. At the time, a massive amount of so-called latent heat was accumulating in the tropical Pacific, Trenberth notes, in an incipient El Niño event. Parcels of warm air from the tropics may have forced the jet stream northward in one place, causing it to meander southward farther east. "It may not be that Arctic amplification is causing a wavier jet stream, it may be that a wavier jet stream is causing Arctic amplification," he says. "I understand that people would be skeptical," Francis says. "It's a new paradigm." But she counsels patience. She notes that evidence of Arctic amplification itself has emerged from the statistical noise only in the last 15 or so years, so it may take time for the changes to the jet stream to become statistically significant. And she believes the modeling experiments that fail to simulate a more meandering jet stream are biased, because they don't include sufficiently robust Arctic amplification. Such arguments have persuaded some colleagues to at least wait and see. Oceanographer James Overland of NOAA's Pacific Marine Environmental Laboratory in Seattle, Washington, for example, says, "I find the tropical explanation for the recent behavior of the jet stream no less implausible than the Arctic one." And he suspects that, as data accumulate, the dynamicists will come to gain a greater appreciation for the Arctic's role. I think it's worth pointing out that Paul Homewood's article is one big strawman. He is trying to refute something that John Holdren didn't say. “As global warming continues?” Do you think Holdren means “when (or if) global warming continues” because it ain’t warmed in nearly 2 decades. A technical question — If global warming causes colder winters, at what point does global warming become global cooling? Or does it all just average out? If it all just averages out, does that mean the earth doesn’t have a fever anymore? Over a year ago, I saw a program on NGC that suggested AGW could cause another ice age. I guess cold winters would be much more common with glaciation. There was a time when I believed that people in highly positions….at least in a democracy….could not just make things up without paying a price. Now the scales have fallen from my eyes. You can say anything you want for the most part and get away with it. Holdren has been making ridiculous claims without being exposed as a serial liar in the MSM for a long time. Ditto Obama. I don’t think it was more than a year ago when the President of the U.S. simply made up his own facts about global warming by asserting that the globe was heating up even faster than the experts had predicted….which of course is utterly false. In fact there’s arguably been no warming at all for over 17 years. Holdren says “cold spells”. Homewood shows Dec-Feb averages. So extreme cold is the result of global warming? Is there ANYTHING global warming can’t do?????? Winters in Contiguous US have been getting cooler for 17 winters or since 1998 , but certainly not for the reasons that Holdren states. 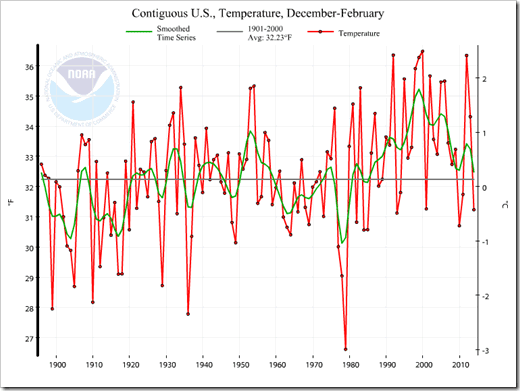 This recent decline in US winter temperatures is similar to the cooler US winter cycles of 1895-1920 and again 1954-1979 and is due to ocean cycles. Holden even recently lied to Congress about previous testimony on US drought by Roger Pielke Jr. When Pielke asked for a retraction and apology, he got a six page White House memo citing one paper. Apparently they cannot read either, because that paper (by Trenberth) also supported the Pielke testimony. Which was simply thatnitmisnot possible to make a connection between drought and climate change, per the IPCC SREX and other papers. It is possible to make regional US connections with PDO and AMO. Why did Holdren try to trash Pielke’s testimony? Because Obama is using the California problem to pump for his climate agenda. Just when you think they cannot stoop lower, they do. No, Rud, that's not why John Holdren had a go at Roger Pielke Jr's testimony. This is. here along the Gulf Coast since the terrible cold decades of the 1980′s and 1960′s. Holdren’s “speculation” is NOT Science. Not even close. As we are cooling from the top, the higher latitudes get drier and the lower latitudes get wetter. Seems I recall that last year’s warmer-than-usual winter was supposed to be the harbinger of things to come. Of course the government would announce this nonsense to uphold their beliefs, and not face the fact Northern America and Canada would suffer most from extra cold winters. I hope that you don’t experience any more extra cold winters for your health mainly and productivity. Your government should take measures now not to rely on the global warming scare but global cooling that will prove a lot more expensive in the long run to adapt to.